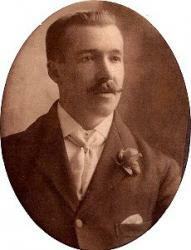 John Hughes was born in 1872 in Penybryn Pembrokeshire, but when he was 3 the family moved to Swansea. He left school at 11 to become an office boy in the Dyffryn Steel Works Morriston and at the time of his death in 1914 he had become the Marketing Manager for the company and travelled worldwide for the business. He taught himself 6 languages. John Hughes composed many hymn tunes while he was travelling. Many of them were for "Gymanfa Ganu" which were popular annual singing festivals in Wales. One day he was approached by Daniel James who asked him to put music to a poem which he had written. John Hughes did so, and played it for the first time on the organ of Philadelphia Chapel where he was the organist. The rest of the story is well known! John married Mary Ann Thomas, and they had 3 daughters, the eldest of whom was my mother. John Hughes died of a cereberal haemorrage in June 1914 at the age of 42, and is buried in the graveyard of Caersalem Chapel in Treboeth Swansea. Born: February 13, 1872, Pen-y-bryn, Pembrokeshire, Wales. Died: June 16, 1914, Stockwell Villas, Mount Pleasant, Swansea, Wales, of a cerebral hemorrhage. Hughes’ family moved to Swansea when he around two years old. He is sometimes confused with the John Hughes who wrote the tune CWM RHONDDA. After following his usual duties at the works on Monday 15th June 1914, John Hughes at night drove an employee, who had a piece of steel lodged in his hand, from Morriston, to the Hospital. It was late when he retired, in his usual cheerful mood, apparently in the best of health, but he soon became ill and his death at 6.45am on Tuesday morning, the 16th June 1914, was caused by a clot of blood on the brain. He died at his residence No. 3 Stockwell Villas, Mount Pleasant, Swansea. He left a widow and three small children. All his friends were extremely grieved to hear of his untimely death at the age of 42. His death deprived the Duffryn Works of a highly capable manager. John’s fresh colour and robust appearance generally flattered, only to deceive. His sad demise came as a great shock to the inhabitants of Morriston, where he was personally known to almost everyone. He died at number 3 Stockwell Villas, Swansea, on the 16th June 1914, aged forty-two, and was buried in the cemetery of Caersalem Newydd Welsh Baptist Chapel in Treboeth, with his parents. Calon Lân one of his best known compositions was sung with much feeling. An impressive service was held at Caersalem Chapel, where the Reverend E. G. Hughes (Ravenhill), D. B. Richards (Brynhyfryd), D. Thomas (Landore), D. Pryse Williams (Philadelphia) and D. Price (Bethesda) paid their last tribute to the departed. The hymn, Dilyn Iesu was also sung. The service at the graveside was very impressive, and the massed choir feelingly rendered Crugyher. The last rites were performed by the Reverend D. James (Morriston) and J. Davies (Mynyddbach). The mourners were Mrs. John Hughes (widow), Mrs. Hughes (mother), Mrs. Bessie and May Hughes (daughters). Other mourners were representatives of the Dyffryn Works, Morriston, of which the deceased was for some years Manager; the works owner, W. H. Edwards (proprietor). Amongst the members of the general public was Leon Vermont (London), Councillors David Matthews J.P. John Lewis Swansea. Employees of the Dyffryn Works Morriston, acted as bearers. It is worthy of note that many of the hymn tunes sung at the funeral were of John Hughes own composition. On Sunday afternoon and evening sympathetic references were made at the Tabernacle Chapel Morriston, of the loss sustained by the untimely death of John Hughes and as a last tribute two of his most popular compositions Dilyn Iesu and Calon Lân were rendered.